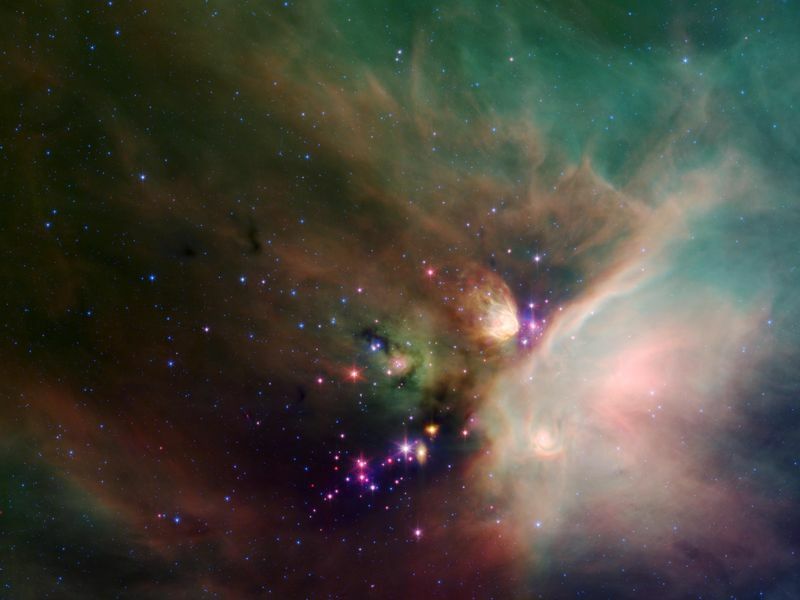 Newborn stars peek out from beneath their natal blanket of dust in this dynamic image of the Rho Ophiuchi dark cloud from NASA's Spitzer Space Telescope. Called "Rho Oph" by astronomers, it's one of the closest star-forming regions to our own solar system. 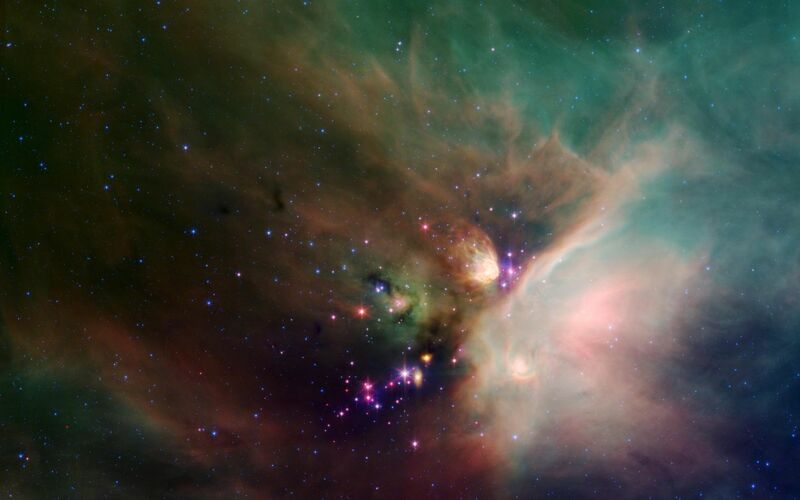 Located near the constellations Scorpius and Ophiuchus, the nebula is about 407 light years away from Earth. Rho Oph is a complex made up of a large main cloud of molecular hydrogen, a key molecule allowing new stars to form from cold cosmic gas, with two long streamers trailing off in different directions. Recent studies using the latest X-ray and infrared observations reveal more than 300 young stellar objects within the large central cloud. Their median age is only 300,000 years, very young compared to some of the universe's oldest stars, which are more than 12 billion years old. 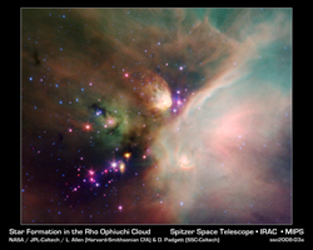 This false-color image of Rho Oph's main cloud, Lynds 1688, was created with data from Spitzer's infrared array camera, which has the highest spatial resolution of Spitzer's three imaging instruments, and its multiband imaging photometer, best for detecting cooler materials. Blue represents 3.6-micron light; green shows light of 8 microns; and red is 24-micron light. The multiple wavelengths reveal different aspects of the dust surrounding and between the embedded stars, yielding information about the stars and their birthplace. The colors in this image reflect the relative temperatures and evolutionary states of the various stars. The youngest stars are surrounded by dusty disks of gas from which they, and their potential planetary systems, are forming. These young disk systems show up as red in this image. Some of these young stellar objects are surrounded by their own compact nebulae. More evolved stars, which have shed their natal material, are blue. The extended white nebula in the center right of the image is a region of the cloud which is glowing in infrared light due to the heating of dust by bright young stars near the right edge of the cloud. Fainter multi-hued diffuse emission fills the image. The color of the nebulosity depends on the temperature, composition and size of the dust grains. Most of the stars forming now are concentrated in a filament of cold, dense gas that shows up as a dark cloud in the lower center and left side of the image against the bright background of the warm dust. Although infrared radiation at 24 microns pierces through dust easily, this dark filament is incredibly opaque, appearing dark even at the longest wavelengths in the image. Spitzer's infrared array camera was built by NASA's Goddard Space Flight Center, Greenbelt, Md. The instrument's principal investigator is Giovanni Fazio of the Harvard-Smithsonian Center for Astrophysics. The multiband imaging photometer for Spitzer was built by Ball Aerospace Corporation, Boulder, Colo.; the University of Arizona; and Boeing North American, Canoga Park, Calif. Its principal investigator is George Rieke of the University of Arizona, Tucson. 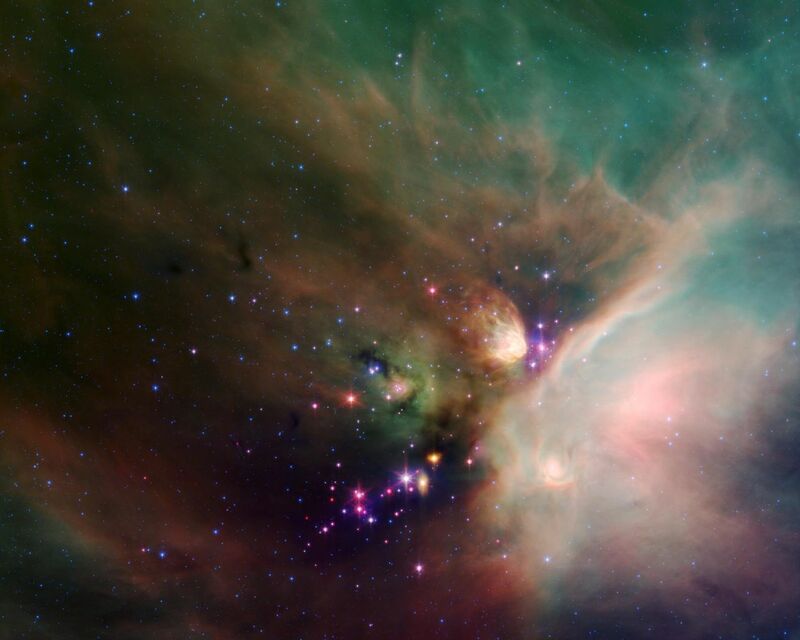 For more information about Spitzer, visit http://www.spitzer.caltech.edu/spitzer and http://www.nasa.gov/spitzer.